Spring snows and June skiing aside, the summer running season is here. Jumping right into things, Christy and I ran the Dirty 30 last Saturday, a 50K course run along the trails of Golden Gate State Park, located northeast of Blackhawk, CO. Now in its 3rd year, the event hosts three races– a 7, 12, and 31 miler (50K)– and in addition to being really scenic, very hilly and just a whole lot of fun, it was a perfect way to log miles early in the season. That is, early, for a couple of people who usually don’t get going until around Memorial Day. The course elevation profile. Click to enlarge but disregard the heart rate/ pace stuff. 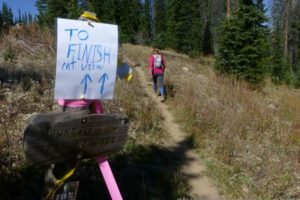 Well organized and supported, the course hovers between 7,500 and 9,500 feet in elevation, and manages to climb about 7,500 vertical feet over the 31 miles. That puts it right on par with a lot of the hillier ultras out there, thus being a perfect warmup/training day for the longer events further into summer. When combined with its length, place on the calendar, and proximity to the Front Range, it’s no surprise it’s popular and fills up quickly. It was only after some time on the wait list that we eventually were told there were spots for us, about two weeks ago. So it’s not news that the Dirty 30 could become a popular race, it already is. While sold out events and wait lists aren’t what people like to see, it’s nice to learn of new events being started to make room for the added demand nowadays, particularly with cool courses such as this one. We would definitely do it again, and when combined with a night in Blackhawk, it’s a fun little getaway. What better way to pre-race load than at an all-u-can eat casino buffet? The 50K course map. Click to enlarge. Thankfully, we both had good a day. 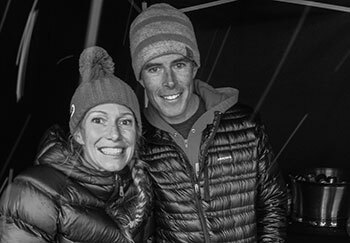 The intention was to log miles, so we went out conservatively and finished feeling good, and optimistic for the season ahead, which is pretty full. With this 50K done, next weekend is the Lake City 50, then the Hardrock 100 three weeks later. 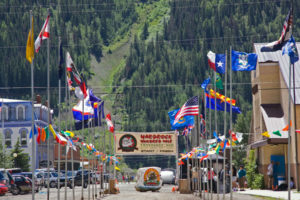 Then, a new Aspen Backcountry Marathon in August, Imogene Pass in September, and the Bear 100 later that month. There might be a flat city marathon after, TBD, for a grand total of about 350 miles of races already booked. Christy’s in all of them as well, but instead of Hardrock she’ll be at the Leadville 50, for the 4th year in a row, the following weekend. We might be over the whole running thing by late summer, but for now we’re looking forward to it. 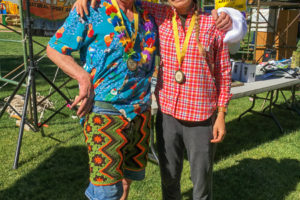 Christy ran the inaugural Run Rabbit Run 100 miler in Steamboat last weekend. I crewed for her and had some thoughts on the race. Forget the running. What did you win at the casino? Or was it just the buffet? Only time for buffet, but Christy’s huge plate of crab legs might have had some assuming she killed it at the penny slots. Nice job, folks. That’s a tough course, and those are some really good times. Funny, I was hanging out at aid 2 that day (spectator), and imagine my surprise when I was taking photos next to the road and saw Christy run by. Whenever I was standing in that spot I was taking shots of everyone, but I wasn’t there the whole time and must have missed you, Ted. I searched for your bib number, didn’t find it. I posted a batch of images here. I think I’ll try to run it next year; the course is interesting and it’s near by. Didn’t see you afterwards but maybe I’ll say hi some other time. That’s an aggressive season ahead; good luck in your other races. PS – Feel free to use any of the photos as you see fit, including Christy’s or whoever. mtnrunner2- Thx. It was fun out there. I was right in the mix, in front of Christy and a good bit behind the popular names you were shooting, but moving up. Around here, we don’t start running too early, so this race is perfect to get into gear, though too early to start with the notion of trying to be fast. You should definitely do it next year.